First of all... Wish all of you a very happy and healthy Diwali..!! We all look forward to festivals, especially Diwali, as it brings lots of fun, yummy food, fire crackers, lots of shopping, meeting our loved ones, and much more! 1. Drink 2 extra glasses of water on all the festival days without fail. 2. Try to chip in 2 bowls (250 gms each) of raw salad throughout the day (anytime you want). 3. Make sure you include any one fruit from this list - orange, sweetlime, guava, papaya, apple, pear, or watermelon. 4. Go for baked snacks instead of fried ones. 5. Have sweets of your choice, but not more than 2 to 3 small pieces. 6. Prepare nutritious varieties of snacks like palak chakli, tomato sev, roasted chivda, etc. 7. Use pure ghee instead of vanaspati, and remember do not over use it..! 8. Watch your portion size when eating the snacks and sweets. 9. Find out ways to burn the calories which you consume throughout the day. 10. Walk as much as possible; take the stairs instead of the elevators. 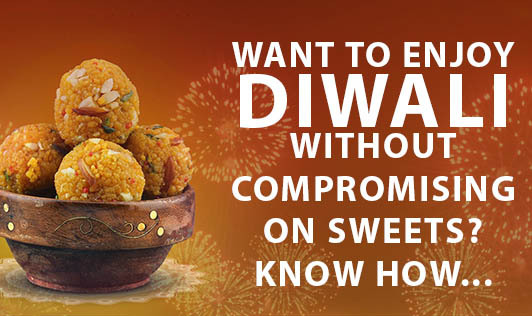 Enjoy the festival of lights and crackers with your loved ones! Stay healthy... Stay safe! !